When visiting Key West, one of the most fun and crucial activities to take part in is a scenic and beautiful Key West dive. The warm and crisp waters surrounding the port are the perfect way to spend a day or let off some stream after a morning of sightseeing. With the plant and ocean life in the Gulf, you will see things you never knew existed and have more fun than you ever thought you could experience. 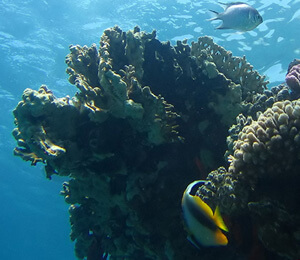 At the Key West Dive Center, we can help you find the right Key West dive or Key West snorkel package that is right for you and perfectly fits the needs of your family. Whether you want to scuba dive or explore the great living coral reef, we here at Key West Dive Center can help you make your dreams a reality. Here are 3 of our favorite Key West dives. Our Lost Reef Key West dive is a wonderful dive for adventures of all ages and skill levels. From the deck of our 40' custom boat, you will dive into the warm salt waters of the Gulf of Mexico and experience an undersea world you only thought existed in your dreams. All of our Lost Reef Key West dive boats come with fresh water shower facilities, rest rooms, large dive platforms, and a host of other amenities including state of the art video and photo equipment to ensure you can take all of the memories you make on your Key West dive home with you. Our knowledgeable and friendly staff will take you through every aspect of your Key West dive adventure to help you know what to look for underwater and keep you safe and sound. If you want to get up close and personal with some of natures friendliest creatures, but don't want to throw on a wetsuit, the Key West Dive Center can help you interact with the dolphins from the comfort of our state of the art glass bottomed boat. Our glass bottomed cruiser comes complete with fresh water, drinks, and plenty of amenities to make your dolphin viewing adventure more enjoyable. If you feel like getting a little wet, there are plenty of options to take a Key West snorkel with these brilliant and social creatures. Taking a Key West snorkel is one of our favorite activities. But getting to the really great snorkeling spots, well that takes some skill. Our 30' boat takes 6 snorkelers to one of 2 pristine Key West snorkel locations. These are places where big boats just can't go. Once there, you and your family will spend an hour in the warm and clear waters of a living coral reef away from prying eyes and other visitors. This Key West snorkel adventure is like having your own private stake in a living coral reef. This is perfect for families and divers of all ages and skill level. Need more help finding Key West Attractions? From scuba diving Key West to Key West inns to booking Key West tours, we have the resources and connections to make your stay in the US's southernmost city fun without breaking the bank.